Fun, musical and beautiful, these drums are made from recycled tin cans and make great gifts for children, grandchildren and young kids. Guatemala has a rich assortment of traditional musical instruments and this hand-crafted Maya Tin Painted Drum is simple and colorful. These drums are made from recycled tin cans and make great gifts for children, grandchildren and young kids. The Maya Tin Painted Drum is created by Maya Kakchiquel, Joaquin Meletz, our artisan friend that makes a living creating a variety of drums, rattles, and other musical instruments. 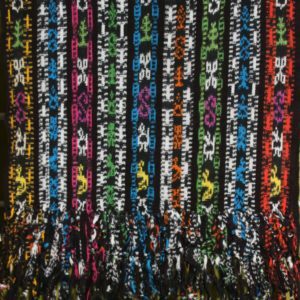 Joaquin Meletz currently lives in Los Encuentros, Solola and works at his home work-shop and continues to provide a variety of high quality musical products to Maya Color. 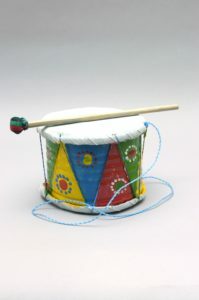 The medium drum is 5 inches tall with a 6.5-inch circumference. They are painted with non-toxic acrylic paint and have suede on top and bottom so you can drum them on both sides.